Birmingham’s Supersonic Festival is, in Fighting Boredom’s humble opinion, the best festival in the UK at the moment. They bring diverse and eclectic lineups to audiences hungry for musical and artistic stimulation. They have just announced their 15th Edition and the iconic Neurosis as the first headliner for this year. 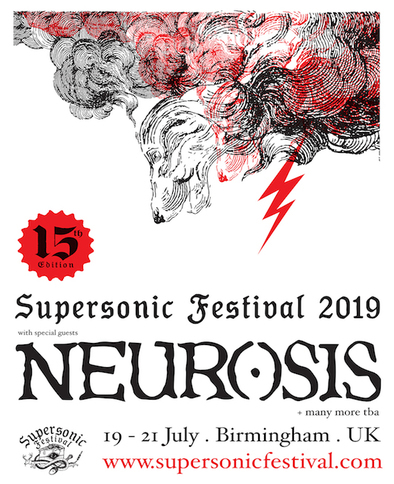 Supersonic Festival have announced that the iconic pioneers of heavy music Neurosis are their 2019 headliners. Over their 30 years of making music Neurosis have ‘relished in the unpredictable and embraced the unknown possibility of where the music was capable of taking them’ which makes them a perfect fit for the festival that has always prided itself as being for curious audiences, guided by the same adventurous and independent spirit. At the same time there will be a major Home of Metal immersive exhibition celebrating the brilliant Black Sabbath. Featuring portraits from the Home of Metal Black Sabbath fan archive, historical photos, ephemera, and memorabilia sourced directly from the band members. Supersonic Festival will take place between the 19th and 21st of July 2018, weekend tickets are on sale now. Fighting Boredom cannot recommend this festival highly enough, it’s pretty much unmissable.